After this series one team will finally shed the baggage of being a well documented underachiever by making a trip to the Stanley Cup Final. Both teams have overcome huge obstacles this post-season to make it this far and neither will gain any satisfaction with merely making the Conference Finals. This is a franchise defining series for both teams and will be exciting to watch. Both teams boast deep, talented groups of forwards. The Sharks are so ridiculously deep at centre that they can play Joe Pavelski on the third line. During the regular season the Sharks had seven players score more than 20 goals and two who scored more than 30. Ryane Clowe is leading the team in scoring this post-season, but reportedly sustained a concussion during the Detroit series. The only Shark forward having a sub-par playoffs is Patrick Marleau who scored his first goal on the second round in game 7. The Canucks are receiving a Conn Smythe post-season from Ryan Kesler who exploded for 11 points in the second round after being held to just 4 in the first round. 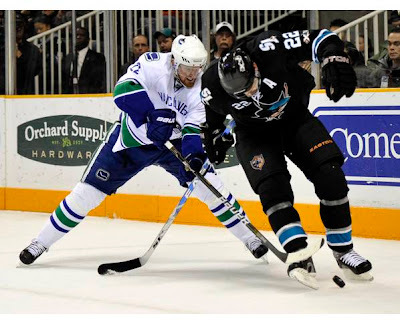 The Sedins have not dominated at any point during the playoffs and both seem tentative at times. However, they have still combined for 19 points, but will need to elevate their play for the Canucks to advance to the Stanley Cup Final. The only Canuck to truly disappoint is Mikael Samuelsson who has 3 points in 11 games. The Sharks defence is their main weakness. It is essentially Dan Boyle and a cast of capable, yet unspectacular players. Ian White is having a good post-season, which will surely fetch him a nice multi-year contract come July 1st. After playing the Predators in the second round and facing a healthy dose of Weber and Suter, the Canucks should salivate at the chance to play against the Sharks defence. The Canucks don’t have a true number 1 defender, nor do they have a true shut-down pair, but they have a collection of six quality, versatile defencemen. Four defenders average close to 25 minutes a game. The Canucks have allowed the fifth fewest goals this post-season, which is impressive considering the Blackhawks throttled them in a few games. Antti Niemi has not provided the Sharks will stellar goaltending – posting a 3.01 GAA and .906 SV%. However, he was excellent in game 7 against the Red Wings, stopping 38 of 40 shots in a thrilling victory. This is Niemi’s second straight year in the Conference Final and, of course, he has experience playing in the Stanley Cup Final, so playing on this stage won’t scare the 27-year-old Fin. Roberto Luongo overcame a Jekyll and Hyde first round against the Hawks with a solid second round against the Predators (who admittedly are must less offensively dynamic). Luongo has a 2.25 GAA and .917 SV%. He was excellent in Vancouver’s game 7 victory over the Hawks, which helped erase the playoff demons that have plagued him for the past two seasons. San Jose’s power-play is a pedestrian 13.7%, which is an issue because the Sharks have drawn 51 penalties – most in the playoffs. The Sharks penalty kill is better than their power-play, operating at a 82.7% efficiency, which is only slightly behind the Canucks. However, the Sharks are one of the most penalized teams this post-season. Vancouver’s power-play ranks fifth this post-season, second among active teams, at a respectable 22.2%. Their penalty kill is fifth in the playoffs and (again) is second to only Tampa Bay among active teams. The Canucks have a robust 86% penalty kill, which will need to continue at this rate because Vancouver is one of the most penalized teams in the playoffs. Todd McLellan has led the Sharks to three straight division titles, although he inherited a team that was already at that level. Those three seasons comprise his entire NHL head coaching experience. Before that he was an assistant coach for the Detroit Red Wings – a nice place to learn your craft. Alain Vigneault, who is somehow 50-years-old, is a former Jack Adams Award winner in 2007 and is a nominee for the award again this season. He was also nominated for the award in 2000 while coaching the Montreal Canadiens. He has led the Canucks to four division titles in five years, although he has never led them past the second round before this season. Both teams survived losing a three game lead to win in dramatic game 7s. Neither team has taken an easy path this playoff, which is attributable to the strength of the Western Conference. Both have played 13 games. The Canucks are a little more rested than the Sharks, but this shouldn't play a role in the series. Losing a 3-0 lead and then winning in game 7 proved something to both the Canucks and the Sharks. They both proved that they could win big, pressure filled games. The Canucks, specifically, proved that they could defeat the Chicago Blackhawks, something that before this season was seemingly impossible. For the Sharks, Joe Thornton is having a great playoffs both offensively and defensively and he was particularly dominant in the Sharks’ must-win against the Red Wings. Dan Boyle, Niclas Wallin, and Antti Niemi have all won a Stanley Cup. In addition, Dany Heatley played in the Stanley Cup Final. Heatley, Marleau, Thornton, and Boyle all played for Canada in last year’s Olympics. This will also be the second Conference Final in a row for most of the Sharks. For the Canucks, only Mikael Samuelsson has won a Stanley Cup. Both Roberto Luongo and Ryan Kesler played in last year’s dramatic Olympic Gold Medal game, but, overall, this is the furthest in the playoffs the Canucks’ core has played.